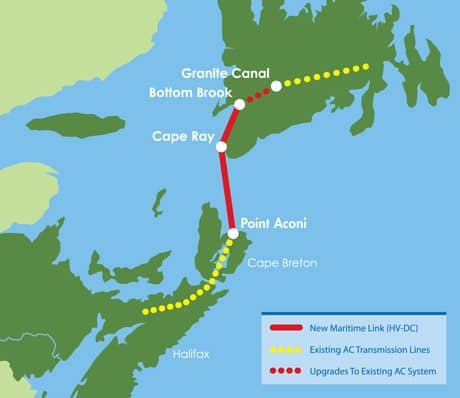 The Maritime Link is a transmission system that includes 180-kilometre subsea cables that will deliver hydroelectric power from Cape Ray in Newfoundland to an area near Point Aconi in Cape Breton. The $1.52-billion Maritime Link is just one component of the larger Muskrat Falls project - worth $7.7 billion - that includes building an 824-megawatt hydroelectric dam on the Lower Churchill River in Labrador and a 1,100-kilometre transmission link to the island of Newfoundland called the Labrador-Island Transmission Link. 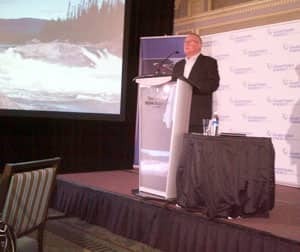 Newfoundland's Nalcor Energy and Nova Scotia's Emera Inc. are partners in the Muskrat Falls megaproject. A new, Emera-owned company called NSP Maritime Link Inc. has been incorporated to apply to the province's regulator, the Nova Scotia Utility and Review Board, and ask it to approve capital spending of between $1.52 billion and $1.58 billion on the Maritime Link. In 2017, the power company will apply to the regulator for permission to charge back the cost of the Maritime Link to ratepayers in Nova Scotia. Emera estimates electricity rates will rise by one per cent in each of the five years from 2018 to 2022 to pay for the Maritime Link. Construction on the Maritime Link scheduled for 2014-2016. First hydroelectricity from Muskrat Falls/Maritime Link by late 2017. There is a $1.52-billion cost estimate as of January 2013. Emera says no more than 10 per cent of this estimate will vary as more engineering studies are completed and the project nears construction. Emera pays 20 per cent of the project costs for 20 per cent of the energy generated by the Muskrat Falls project for 35 years. The project is composed of 70 per cent debt (backed by a loan guarantee from Ottawa) and 30 per cent equity (Emera Inc.). Emera is asking for a 9.1 per cent return on its equity in the Maritime Link. The debt will be lowered as ratepayers pay for the hydroelectricity over 35 years. A federal loan guarantee is estimated to provide cost savings to ratepayers in excess of $100 million. At the end of the term, ownership of the Maritime Link will be transferred from Emera to Nalcor Energy, although the contract permits renegotiation on this point before the end of 30 years. 2,700 person hours of work related to the Maritime Link spread over both provinces. This equates to about 270 fulltime jobs over 10 years, according to the Province of Nova Scotia. Why Muskrat Falls and the Maritime Link? Federal and provincial laws require Nova Scotia Power to reduce its dependence on coal. By 2025, Nova Scotia's Electricity Act says 40 per cent of the province's electricity must be generated from renewable sources. Nova Scotia is currently at 18 per cent. 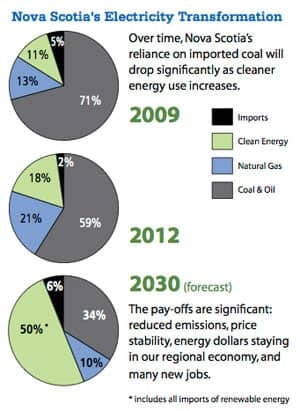 By 2030, federal regulations say Nova Scotia must reduce greenhouse gas emissions by 55 per cent. Renewable hydro from Muskrat Falls would supply up to 10 per cent of the province's total electricity requirements, enough to supply 100,000 homes, according to Nova Scotia's Department of Energy. Emera also plans to import hydro over the Maritime Link from the existing Churchill Falls power plant in Labrador to replace a total of 30 per cent of the electricity made in Nova Scotia today. Adding renewable energy from Labrador would act as backup for wind power in Nova Scotia and allow for the future development of more hydro, wind and tidal in this province. Importing power from Newfoundland gives Nova Scotia a second source of power from a different direction. That would make Nova Scotia part of a regional energy loop rather than isolated at the end of a line. The Maritime Link opens the door to importing more renewable energy from New England, New Brunswick and Quebec than is possible today. Emera claims the alternatives cost more than the Maritime Link. Both Emera and the Dalton Report say a new transmission line estimated at about $1 billion would need to be built through New Brunswick to import power from Quebec. Studies commissioned by Emera say importing electricity from Quebec would cost about $300 million to $500 million more than the Maritime Link. Another study for Emera pegs the cost of adding more wind farms and natural gas in at up to $1.9 billion more than the Maritime Link. 1. The Nova Scotia Utility and Review Board will hold a public hearing to examine the application from NSP Maritime Link Inc. The UARB has the authority to hire its own experts to review the application and it has the authority to reject it. The Board will review the Maritime Link Project using these terms of reference. As part of the regulatory process, the province of Nova Scotia is supporting the application from NSP Maritime Link. The province will submit a report prepared by consultant John Dalton of Power Advisory LLC of Massachusetts. 2. Emera has filed a 730-page environmental assessment report that describes the impact of the construction of the Maritime Link on the marine and onshore environment where a substation and power lines will be built. It discusses how those effects would be mitigated, including proposed compensation to commercial fishermen in the Cabot Strait. The assessment must be approved by the Canadian Environmental Assessment Agency as well as the environment ministers of Nova Scotia and Newfoundland and Labrador. Where do you stand on the Maritime Link plan?